We note that technology does not refer only to the machines and computers that make up our industry. It also refers to those identical methods, procedures, and practices that men employ equally upon others and in this way imitates the action of efficient machines. This can be seen in the development of bureaucracy, teaching methods, advertising, and public relations practices. All these techniques tend to imitate the processes of a machine or computer. The family, for example, often delegates its functions to experts outside the family and home who provide uniform child-care, education, entertainment, and counseling to its members. 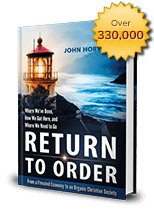 Click Here, For a Free Return to Order Workbook! Today there is no field of human action that in some aspects is not modified in such a way as to impel men to act like a machine or computer. Inside these systems, all must be simplified, planned, and engineered to adapt to the machine and subsequently minimize individuality and maximize efficiency. 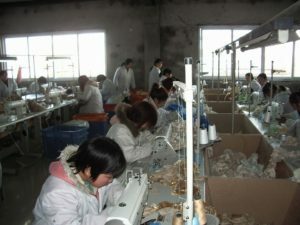 In our turn-key franchises, for example, every procedure is planned out in detail to ensure “discipline, order, systematization, formalization, routine, consistency, and methodical operation.”2 In such a regime, the individual is reduced to a depersonalized “unit” to be inserted, replaced, and deleted at will in the industrial processes. An Excerpt from the book, Return to Order: From a Frenzied Economy to an Organic Christian Society—Where We’ve Been, How We Got Here, and Where We Need to Go. 1 Robert A. Nisbet, The Social Bond: An Introduction to the Study of Society (New York: Alfred A. Knopf, 1970), 245. 2 Ritzer, McDonaldization of Society, 97. This entry was posted in Featured and tagged America, brutal pace of life, false happiness, mechanical existence, Utilitarianism by John Horvat II. Bookmark the permalink.